How Should Illinois Pay for Education? After pensions, the biggest issue facing Illinois taxpayers (at least, until the impending Medicaid crisis overtakes it) is education funding. How we fund our schools has an impact at every level of government, from the fight over allocation of Federal dollars to figuring out what parts of the education system is the State’s responsibility to the crushing burden of the cost of schools on our local property taxes. In the book “Fixing Illinois”, the authors quip that “[t]here is an old saying that only six people really understand the Illinois state school aid formula, and they are not allowed to travel on the same plane.” That’s a pretty sad commentary when you think about it, and dangerous, too, because the more you complicate anything in government, the easier it is for special interests to inject themselves into the process and drive up costs even further. 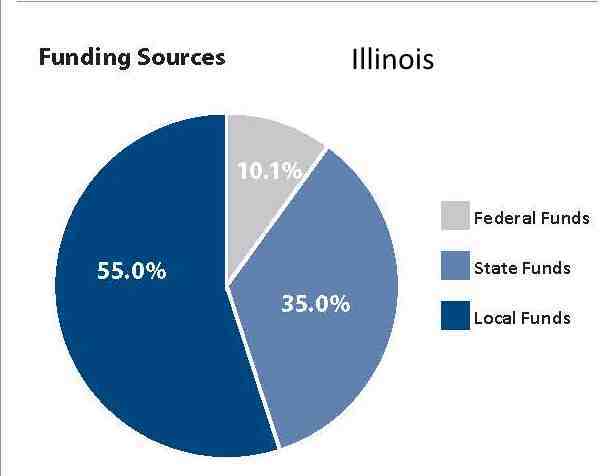 Illinois has long relied upon property taxes as the primary source of funding for our schools. However, it’s time to re-examine that model. There’s too much of a disparity in property values throughout the state for us to expect real estate taxes to provide a quality education to every child. Hovering over this argument is the recent U.S. Supreme Court decision in Texas Department of Housing and Community Affairs v. The Inclusive Communities Project Inc., which ruled that housing policies that are designed and implemented without discriminatory intent but have some disproportionate effect (i.e., “disparate impact”) based on race or some other legally protected class can be invalidated. In short, “disparate impact theory” allows government agencies to prove discrimination without showing that anyone actually did anything to intentionally discriminate. It’s not too much of a stretch to conclude that this ruling will soon extend itself to the issue of school funding. To set the stage, please look at the following chart. 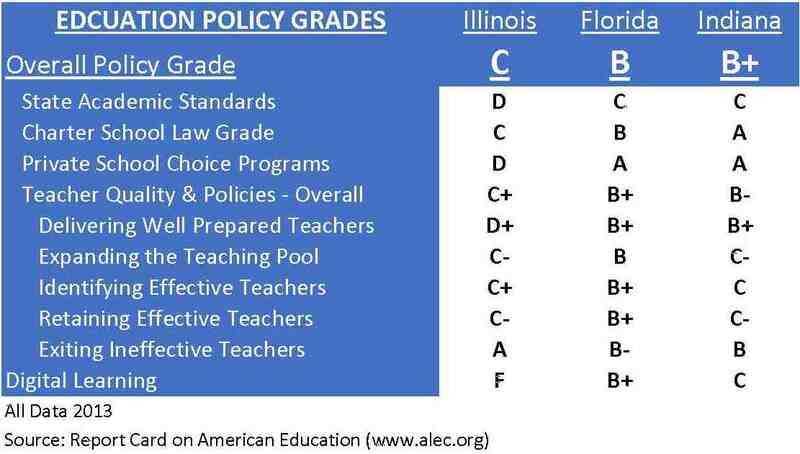 It’s from the American Legislative Exchange Council’s (ALEC) Report Card on American Education, which grades every state on a variety of metrics relating to education performance. As this series of posts continues, I’d ask that the reader refer back to this chart to see why it is our schools are in the shape they’re in, and what can be done to improve on Illinois’ relatively poor showing. The way we fund our schools is not just a pocketbook issue, it affects the quality of education we give our children and the quality of citizens that they ultimately become. This entry was posted in Education and tagged American Legislative Exchange Council, Disparate Impact, Education Funding. Bookmark the permalink.